Click or press on a book cover for more info. Here’s an interesting way to add a crocheted edging to socks. Originally designed by Mary Card in 1919 as a table scarf or tablecloth end, this pattern could be adapted for a curtain by making the sides straight. Designed by Grace Davis in 1921, this scalloped edging is a great way to get started with learning intermediate filet crochet: there are clear instructions for increases, decreases, and making a turned corner. 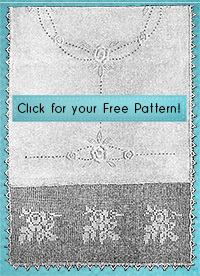 The pattern includes a matching insertion pattern. Designed by Lilian Barton Wilson in 1921, this easy filet crochet panel was inspired by an old English design from the sixteenth century period, and carries a suggestion of chivalry. There will come a time when you’ll need to change colors or add thread in the middle of your project. When I learned to knit and crochet, I was told that knots are a no-no. They are too lumpy and hard to hide. If you just weave in your ends enough, nothing will come loose.